Travel guidebooks have been travelers’ silent companions ever since the first Baedeker Guide appeared in bookstores in the 19th century. Now Web researchers have a guidebook just as thorough as any Baedeker. 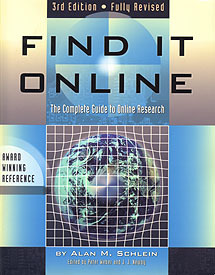 The third edition of Alan Schlein's "Find It Online" not only guides the researcher to the web's most interesting and exotic information resources, but also acts as a hands-on tutorial for becoming a searching expert. Schlein writes in a conversational, but authoritative tone, reflecting his background as an award-winning journalist. He devotes the first part of his 500-page book to searching tools and techniques–search engines, specialized tools, and fee-based services. He also discusses exceptional content sites and offers annotated links to some of the best resources on the Web. He also devotes entire chapters to government sources online, public records, news resources, and business tools. Another chapter illustrates how to use these sources with example searches. their own personal information. Schlein offers sidebars written by contributing experts, offering further insight into a wide range of topics. Schlein focuses much of his book on preparing for a search, a topic often overlooked by other searching tutorials. He advises readers who need to go deep into a subject to create their own detailed plan of attack before they begin their search to avoid wasted hours searching in all the wrong places and running into dead-ends. I particularly liked the "hot tips" that are scattered throughout the book. These are small bits of wisdom Schlein has picked up from years of experience searching and teaching. Some tips are technical pointers, others are cautionary notes for avoiding trouble with tough searching problems. The third edition of the book expands and updates the previous editions, and adds a more global reach in coverage. For those readers who own an earlier edition, the third edition is a worthwhile upgrade for both the new information and updated links. Find It Online is a useful reference guide for novice and experienced searchers alike.